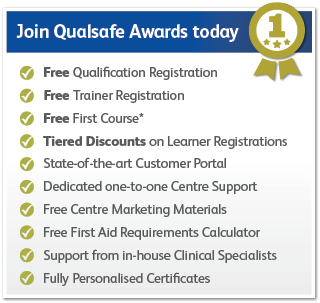 * Free first course offer entitles new Centres to a maximum of 12 free Learner Registrations for a Qualsafe Awards qualification of their choice (up to a value of £10.00 per Learner Registration. Excludes QA Level 2 Award in citizenAID (RQF)). Offer expires after 3 months of Centre Approval and cannot be used in conjunction with any other discount. Use of First Aid Requirements Calculator subject to a Centre delivering QA qualifications within 3 months of approval. Standard terms and conditions apply. Please note that all prices are exclusive of VAT. E&O Excepted.